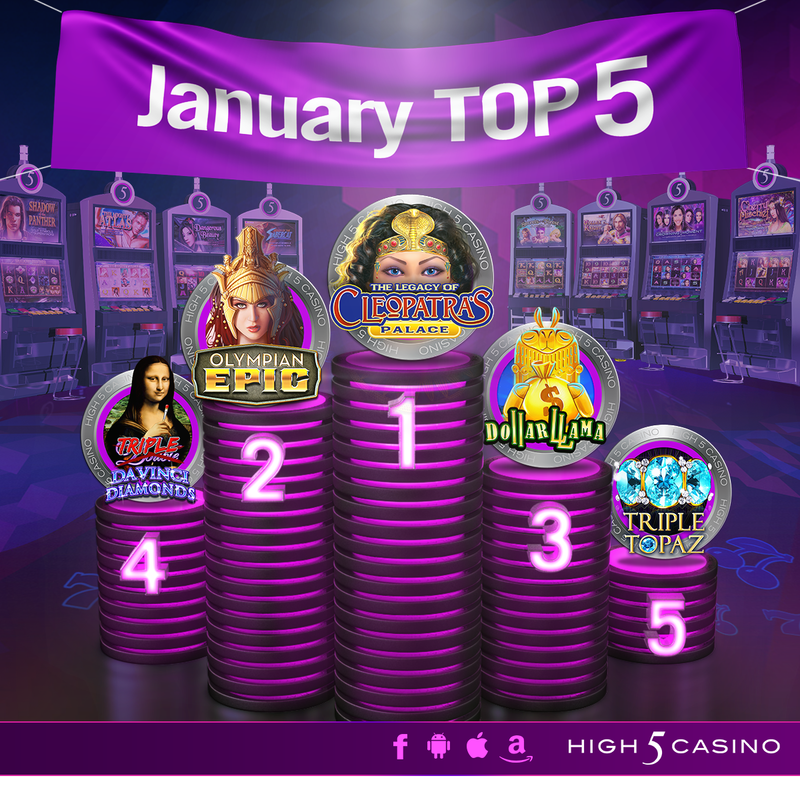 High 5 Casino’s January Statistics! Hello, High 5-ers! The first month of 2018 flew by! February is here and before we celebrate the ones we love on Valentine’s Day and ring in the Chinese New Year, let’s take a look back at how 2018 started off with a bang! To kick off the New Year, High 5 Casino released four new games with weekly themed XP events, as well as the weekly High 5-ers favorite, raffles! New games celebrating their one monthiversary include The Legacy of Cleopatra’s Palace, Olympian Epic, Miss Universe® Timeless Beauty, and Triple Double Da Vinci Diamonds! From our Legendary Slots XP to Triple Double Da Vinci Diamonds XP events, players were able to level up their Game Level 2X or 3X faster in selected slots, celebrating the new game releases! With all these spin-tastic events January 2018 brought, High 5-ers spun the reels over 1.9 TRILLION times, winning over 121.75 TRILLION coins collectively! What was your BIG WIN that contributed? Most-played tournament: The Three Graces, Prize Party! Which game gave you your High 5 Moment in January? Do you LOVE Triple Double Da Vinci Diamonds as much as we do? Comment in the conversation bubble located on the top right corner of your screen and let us know! This entry was posted in H5C Stats, High 5 Casino, High 5 Games, High 5 Moments, statistics, top games and tagged High 5 Casino, High 5 Game, High 5 Moment, High 5-ers, January Stats, statistics by hoothigh5. Bookmark the permalink.